THE man shot and dumped from a car on a suburban Gold Coast street was attacked by a group of up to four men known to him, police say. The group remains on the run. Police said the 46-year-old victim, who was taken to hospital in a serious but stable condition, was shot in a targeted attack and said they didn't believe the public was in danger. They said the victim was known to police but do not believe the Helensvale shooting was bikie or gang-related. "At this point in time, we have no information to believe that these males are a danger to any other member of the public," Detective Inspector Mark Thompson said. "I don't want to create any fear amongst the public that this is an ongoing and dangerous situation." Det Insp Thompson said police were keen to hear from anyone who saw a group of men in a silver or gold hatchback around the Runaway Bay Shopping Centre in Lae Dr or on Helensvale Road at Helensvale before the shooting. Police were called to the scene about 2.30pm. 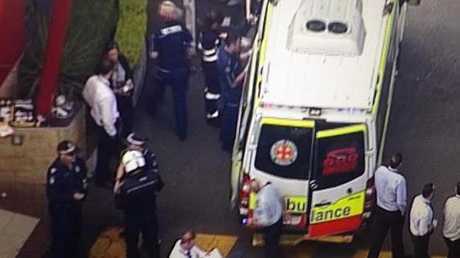 Paramedics from the Queensland Ambulance Service High Acuity Response Unit took the man to the Gold Coast University Hospital in a serious but stable condition. He is believed to have a significant wound to one of his lower legs and has lost a large amount of blood. A 100m section of Helensvale Rd was closed off and police were directing westbound traffic along Monterey Keys Drive. The road was re-opened by 5.30pm but delays were expected. Officers were still at the scene at 4.30pm. Uniformed officers were standing guard at the crime scene borders, while a forensic officer took photos and bagged evidence on the side of the road. "I thought it was an animal at first on the road," she said. "All I could see was the big fluffy thing - he had lots of hair. "It looked like he had no shirt on and had tattoos all down his arms, quite a stocky guy. "Just in the foetal position, and some guys who looked like council workers came and put a blanket on him." The woman said she didn't know if he'd been hit by a car, or what exactly had happened. "I couldn't see any blood, or car around," she said. "He was just lying there - I rang my friend who works in the shopping centre and said there's a guy lying here (on Helensvale Rd), he looks dead." She said when she'd heard what happened, she was concerned. "It was pretty freaky - frightening that it's happening in our own suburb, so close to the school, homes and shops - especially at the time it happened." Police regional Assistant Commissioner Brian Wilkins earlier confirmed a man had been shot in the leg. "It's very early stages in the investigation." Monterey Keys Drive runs between Helensvale and Hope Island roads, just east of the Pacific Motorway. The street is in the canal residential area of the northern Gold Coast, near Hope Island Golf Course. Students from the nearby Helensvale State High School said when they finished school, teachers and police were out the front leading them the "long way around" to get home. "All we know is there was a shooting," they said. "We didn't know what had happened until our parents text us." The group said their parents told them someone was shot. "And they were dragged from a car," one student said. "Then we thought he was on the loose and running through the school." Local business owners said they were completely unaware of what happened and put the traffic build-up down to the afternoon school runs. "It wasn't until I got a call from a friend, who said 'did you know there's a big burley guy with no top on, covered in tattoos with red hair lying on the side of the road? '," one lady said. "Then there were about six marked, four unmarked police cars and about 20 detectives coming through." It was then, she said, they closed the road off and began directing traffic around. "Then I thought, this is serious." Members from Jetts gym in the Monterey keys shopping village said it was too loud inside to hear anything, and only when they tried to leave did they find out what happened. "I've just been waiting around until I can leave," one woman named Sarah said. "Came outside and there were so many people around. It was hectic." A witness, who declined to be named, said there were police cars all over the road when he drove past. He said there were at least three ambulances, with Pol Air circling the area.